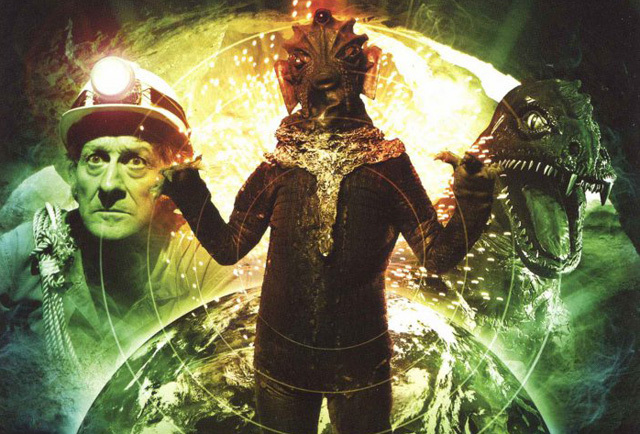 Looking Back At DOCTOR WHO AND THE SILURIANS | Warped Factor - Words in the Key of Geek. Where better to start in the process of thinking upon the issue of homo reptilia and their long self-proclaimed right to call themselves the true original inhabitants of Earth than the moment they woke from their thousands of years of slumber? Doctor Who And The Silurians was only the second adventure for the newly regenerated Third Doctor, broadcast in seven parts from January 31st, 1970. A network of caves in Derbyshire has been playing host to them, and Wenley Moor's nuclear research facility is to blame. We've all heard of getting out of the wrong side of bed, of course - but this rather takes the biscuit! Throw in a Doctor who's just getting to know himself, having been exiled to Earth, and forced to do the previously unthinkable and get himself a proper job! As those of us stuck in the nine to five grind know only too well there's little time to be wasted when it comes to work- though this is no ordinary interview. BRIGADIER: Not so fast. I have a lot of questions to ask you. DOCTOR: My dear Brigadier, it's no earthly good asking me a lot of questions. I've lost my memory, you see? BRIGADIER: How do I know that you're not am imposter? DOCTOR: Ah, but you don't, you don't. Only I know that. What do you think of my new face, by the way? I wasn't too sure about it myself to begin with. But it sort of grows on you. Very flexible, you know. Could be useful on the planet Delphon, where they communicate with their eyebrows. Well, that's strange. How on Earth did I remember that? BRIGADIER: All right, all right, if I accept that you are the Doctor, there are still a lot of things. Oh, by the way, this is Miss Shaw. DOCTOR: That's Delphon for how do you do. Delighted, Miss Shaw, delighted. DOCTOR: Practically everything, my dear. Scientific adviser to UNIT? Easy. And the Doctor isn't bothered by such trivial things as the daily commute and getting an honest wage to make a living. Instead he's more concerned with getting down to business! After dispatching the Nestene Consciousness/Autons from present-day Earth, his next assignment sees he and new companion/lab assistant Liz Shaw dealing with a quite literal blast from the prehistoric past. Whichever name you know them by, be it Silurians, Eocenes or homo reptilia, they're back on very familiar ground. And they want their Earth back! Or at least some of them do. For there are divisions among them as to how to treat the "apes" as they deem us humans. SILURIAN: Is your species the only intelligent lifeform? BAKER: Only intelligent lifeform? Oh, I see what you mean. Yes, of course we are. SILURIAN: You were carrying a simple projectile weapon. Do all your species carry these weapons? BAKER: Of course not. Only soldiers. SILURIAN: What other weapons do your soldiers carry? BAKER: I refuse to answer that sort of question. BAKER: You can do what you like, I will not tell you anything. I will not tell you anything! SILURIAN: The creature is becoming aggressive again. SILURIAN: I will force it to answer. SILURIAN: I do not wish it to be damaged. This creature is less intelligent. Quinn should not have been killed. SILURIAN : But he tried to keep one of us prisoner. SILURIAN: This strange species has developed some kind of civilisation. We need to study it. SILURIAN: The species is dangerous and hostile. We should kill them all. The Doctor, however, is keen to find a more peaceable means of settling a rapidly escalating conflict between those who colonised Earth while homo reptilia was asleep, and the now fully awake & very angry Eocenes. LIZ: Why didn't you tell the Brigadier? DOCTOR: Because I want to find out more about these creatures. They're not necessarily hostile. DOCTOR: Yes, but only to escape. It didn't kill you. It didn't attack me when I was in Quinn's cottage. Well, don't you see? They only attack for survival. Well, human beings behave in very much the same way. Of course, he has a point- much as we wouldn't like to admit it! A somewhat less deadly primal instinct is also awakened in those members of the human race who get a glimpse of the reptiles who once stood on soil they now call their own, the regression causing them to doodle what look like cave paintings on any nearby walls. DOCTOR: Of course it's evidence. BRIGADIER: Look, this poor devil sees his friend killed in an accident, he wanders around those caves for hours before they get him out, well quite naturally he has some kind of breakdown. DOCTOR: Which turns him into a brilliant Paleolithic cave artist? What about the logs, then? Those torn out pages? BRIGADIER: Now there you may have something. Could be sabotage, I suppose. BRIGADIER: Or someone trying to cover up simple incompetence. DOCTOR: Lethbridge-Stewart, what on Earth is the point of my trying to discover things for you if you keep turning them down all the time. BRIGADIER: Then I suggest you discover something I can't dismiss. That discovery is made, of course- with repercussions for the Silurians, though the Doctor will have the chance to right the wrongs done here in the novel Scales Of Injustice, which also attempts to iron out a few continuity issues dating from their later shared billing with the Sea Devils in Warriors Of The Deep. But by that time the Doctor is a very different man!